Clockwise from left, Mike Engelmann of Saugus reads about the LazyBetty, a wooden washing machine; a turn-of-the-century Fourth of July parade float for A.J. Sprague’s, the last manufacturer of woodenware in town; tiny wooden toy furniture, for which Hingham coopers also became famous. For more than a century it sat relatively untouched, shuttered up and vine-covered, on an 18-acre Hingham farmstead passed down through generations. Finally, one day, a rusted lock was removed, the vines cut back, and the door of the wooden shed groaned open to reveal a preserved world. Cluttered inside, through the dusky light of its windows and beyond the dust and spider webs, were all manner of tools, raw materials, patterns, account books, and toys and boxes in various states of completion. It was a rare and extraordinary find: one of Hingham’s last woodcrafting shops, and one of the oldest toy-making workshops in America, sitting unassumingly on a pasture on the Hersey estate. Now, many of the long-hidden artifacts found within – along with numerous other antique woodcrafts spanning various eras – are on view for the first time in “Bucket Town: Four Centuries of Toymaking and Coopering in Hingham,” an exhibit at Old Sturbridge Village meant to honor the town’s illustrious and prolific woodworking past and its wide-ranging impact. Curated by Bray and Christie Jackson, the show will be on display through Jan. 18. Located in the living history museum’s visitors center, the exhibit includes more than 180 items from the Hersey family as well as private collectors and historical societies and museums. “The idea was to focus on individual makers and folks who became so prominent in the field,” said collections manager Rebecca Beall. That includes the town’s first cooper, Thomas Lincoln, who settled in 1635, as well as other respected craftsmen such as William Luce, Loring Cushing, and Augustus Hudson. The Hersey family, who first settled in town in the 1730s, was among the most influential of Hingham coopers, a term dating to the 14th century and referring to the craft of making, repairing, furnishing, or fixing. Patriarch Reuben Hersey and his sons and grandsons were joined by hundreds of other artisans, establishing Hingham as the woodenware hub of early America, and earning it the distinction of “Bucket Town” – after one of its most prolific exports. Generally speaking, the focus was on lightweight containers – pails for milk and water, tubs for curing meat or laundering – as Bray explained, “any kind of wooden container that you could conceive of,” that were then shipped to Boston, down the Eastern seaboard, and as far away as Canada, Hawaii, California, and even the West Indies. Hingham’s coopers also played a pivotal part in the Revolutionary War, producing in 20 days 5,000 canteens, drinking vessels that remained a staple of the US Army for years. The introduction of steamship service between Boston and Hingham in 1819, as well as the arrival of mechanized tools in the 1830s, further fueled the industry. But out of everyday items soon came toys: With steamship service proliferating by the late 18th century, coopers began making miniature versions of their goods to sell to tourists. With that market taking off, William Tower opened one of the country’s first toy factories in Hingham. The practical wares and their more whimsical counterparts are juxtaposed side by side in the exhibit. Buckets range from the size of nickels to full-sized basins water-stained and nicked by time, and vary from well-known “Hingham blue” to red, green, and yellow, some covered with clasps, buttons, and equipped with twine handles, others decorated ever so delicately with tiny flowers or eagles. Interspersed with them are tiny yellow rockers and chairs no taller than 6 inches; mini desks complete with drawers and knobs the size of pinheads; high-back chairs about a foot high with intricately woven fiber seats; a tiny grandfather clock stuck at 3 o’clock for eternity; and teeny wash stands, towel racks, wash buckets with washboards, and butter churners. In a nod to the Herseys, the exhibit replicates the experience of those who first peered into the recently rediscovered workshop by placing many of the tiniest items behind windowpanes. That included account books with impeccable handwriting, all manner of tools, stamps, clamps, molds, as well as personal items such as tobacco, tea tins, liquor bottles, and a photograph of Abraham Lincoln and his family (the Herseys were related to the Lincolns by marriage). The family eventually hired Bray to research their history, a project he worked on full time for a little more than three years, he said, studying tax, property, and court records, probate inventories, visiting historical societies, public libraries, museums, and speaking with private collectors. Eventually, they approached Old Sturbridge Village – as opposed to the much closer Plimoth Plantation – because its focus on the late 18th to mid-19th centuries fit with the most prolific period of coopering and toy-making in Hingham. “The topic is right in their wheelhouse,” said Bray. But why did Hingham come to such prominence in the woodenware industry? Bray noted the proximity to Boston, as well as water access and abundant cedar in swampy lands around the town. But ultimately, it came down to hard work and Yankee perseverance. 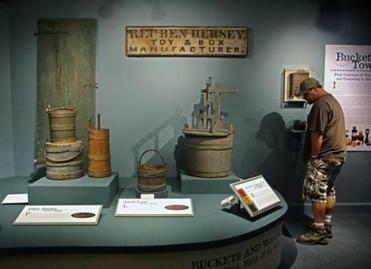 Bray says buckets haven’t been made in town for more than 100 years, and the toy-making industry petered out by World War II. Today, Lindsay Malone, great-great-granddaughter of Reuben Hersey, makes bucket jewelry (in the shapes of the coopering buckets) that are sold at Whitney Gordon Jewelers in Hingham. The ornamental mementos of the town’s glorious past may be viewed at the website www.buckettown.com. From 9 a.m. to 4 p.m. on Oct. 25, join Bray, art dealer and scholar David Schorsch, and decoy carver Bob Mosher for a collector’s forum. Register at www.osv.org/buckettown-forum. For more details on the exhibit, visit www.osv.org/buckettown. For details on purchasing Bray’s book, visit shop.osv.org/a543/bucket-town.html.